Welcome to the Free Beer store!! Yes, we now that Free Beer tool almost 20 years before printing our first T-Shirt. 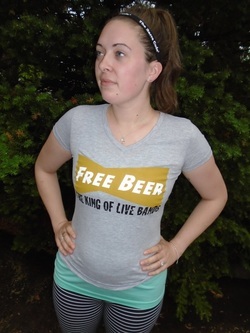 But now that we are in the marketplace it's time for EVERYONE to have a Free Beer T-Shirt. If you would like to buy on with your credit card or Pay Pal account, this is the place to do it. 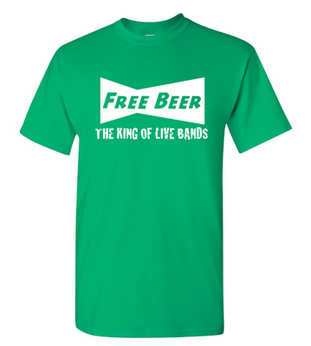 Otherwise just send and e-mail to Store@FreeBeerNet.com with what size color and quantity of shirts you want, and we will bring it to you at our next gig!! This is our first foray into women's clothing. Actually, not true. We've been in women's clothing for years. That came out wrong. We take off women's clothes! Nope ... I'm going to stop now. We are selling Ladies T-Shirts for the first time. 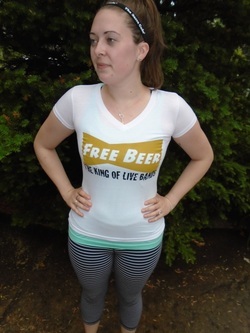 It's a V-Neck that comes in Grey or White with the 3 color Free Beer logo on the front right across the ... uh ... the middle. There are only 12 in the first run. Don't miss out. If you are going to see us play, click the link to pay for it now and pick it up at our next gig. If you are afraid we will run out of your size, then pay the extra $5.00 and we will send it to you. Why is this our official St. Patrick's Day T-Shirt? Because it's GREEN that's why. Will you look cool in it? Yes. Any more questions? If you want one, there are only 15 like it, so it is already a collectors item. They are only $10.00 ... just click the link to pay for it now and pick it up at our next gig. If you just want it for your collection, then pay the extra $5.00 and we will send it to you.